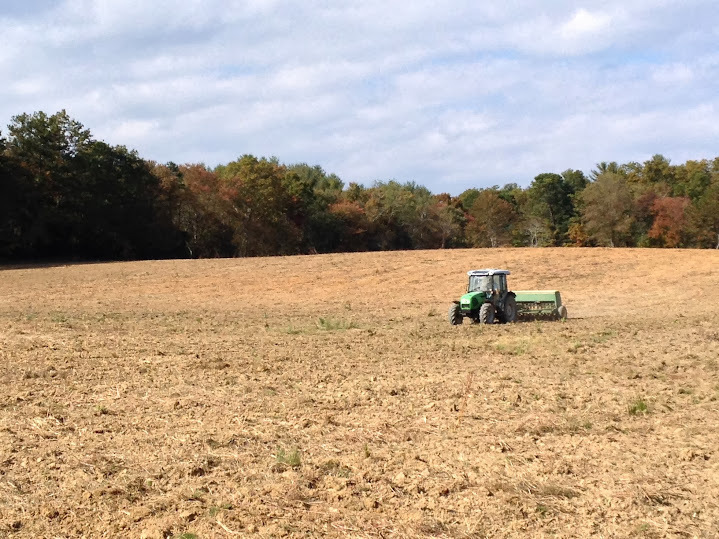 Preparation for our first round of plantings in Western North Carolina began several months ago at our roundtable discussion with the NC State Cooperative Extension and the United States Department of Agriculture (USDA) in Henderson County. These early meetings introduced us to two farmers, Jason Davis and Tony Hill, who were willing to experiment with growing malting barley in the mountains. Our initial meetings included a review of the 2012 Official Variety Trial (OVT) results from North Carolina and Virginia. Data from these trials serve as a guide to manage weed and disease pressure at crucial periods of plant growth. 1) Thoroughbred (6-row) Plantings – We chose this variety to work with in 2010 based on our conversations with the small grains researchers at the USDA and NC State University. This variety was developed from a malting quality variety called Plaisant (French 6-row variety) and performs well throughout the piedmont and coastal plain regions of North Carolina. Tony Hill agreed to plant 30 acres and Jason Davis has planted 12 acres right across from the new Sierra Nevada facility! 2) Endeavor (2-row) Plantings – Historically, 2-row barley trials in Virginia and North Carolina have not supported commercial production due to high levels of disease pressure and low yields. However, the recently released Endeavor variety offers an exciting opportunity to bring a viable 2-row variety to the craft breweries of the southeast. 3) OVT Plots – Jason Davis, owner of North River Farms, offered a small plot of land for researchers to conduct small-scale testing of more experimental varieties in our area. Data collected from these plots will help guide the selection and development of new 6-row and 2-row varieties that thrive in our climate. Check out this great article from Blue Ridge Now for more information on our plantings in WNC and see our Facebook page for more photos from the field trials. We’ll keep you posted on the progress this spring! Nailing down a planting date for the Endeavor took some careful planning. On one hand, we had to avoid heavy rainfall, on the other, we needed to beat the first frost. Looking ahead to next year, we had to get the barley in the ground so it wouldn’t interfere with Tony’s soybean crop. We settled on a day in late October for the planting and headed down to Hendersonville to witness a “day in the life” of a barley farmer. Arriving at Tony’s farm on a sunny fall afternoon, Tony’s father was just finishing up tilling the field, driving the tractor in big, slow circles around the 10-acre plot. Life moves at a different pace out on the farm. So many of us are plugged into current events, email, a daily storm of activity…it seems much slower and more deliberate out in the field. Tony was proud to point out that his dad is 91 years old and still working the land! As we scoped out the field the day before, Tony showed us a crop of tomatoes his son had grown and invited us to pick some before the frost. Working with a triple-generation, family business like Tony’s is exactly the kind of relationship we’re trying to bring back to the food system. It’s something that’s lost in most of the beer industry. We know that the work we do out here will have a big impact in years to come, bringing the farming community together with the brewing community to build a robust, local beer economy. Tony mentioned that one of his friends is interested in growing for us…this is how we start a movement! Tony plants seed for the Endeavor barley in Henderson County, NC. RESEARCH TRIALS BEGIN … IN NEW ZEALAND? ← CELEBRATE NC BEER MONTH AT THE MONK!